There's this cathedral that's still being worked on, and the workers have rigged a "cage elevator" inside so they can get material up and down to the upper floors. A characteristic of these "cage elevators" is that the doors (gate) must be closed manually for them to be "called" to another floor. One day one of the workers, Peter by name, takes the elevator to the top floor, and it is subsequently needed on the first floor by the sexton. Unfortunately, Peter forgot and left the door open. 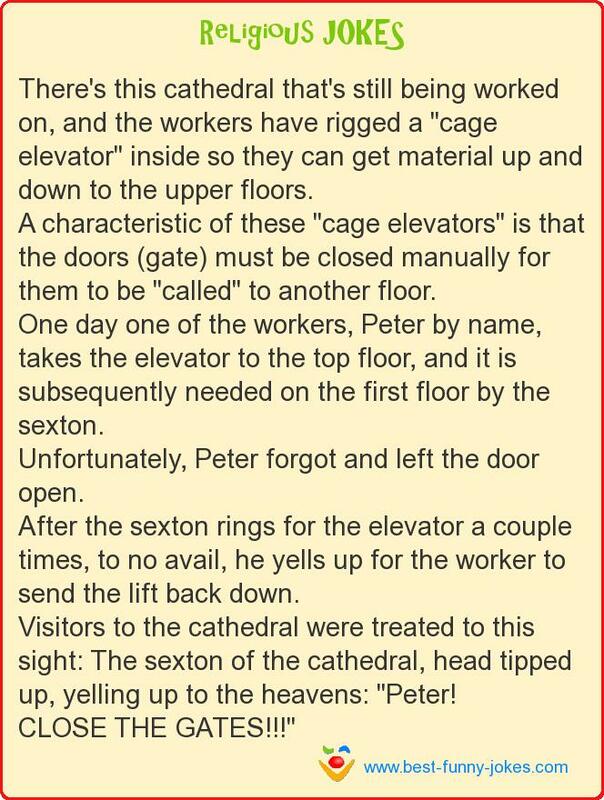 After the sexton rings for the elevator a couple times, to no avail, he yells up for the worker to send the lift back down. Visitors to the cathedral were treated to this sight: The sexton of the cathedral, head tipped up, yelling up to the heavens: "Peter!